CCWG staff have assisted local and regional partners in the development of climate mitigation and adaptation plans for the central coast. CCWG is focused on supporting adaptation planning through the collection of regional data and the coordination of adaptation planning among jurisdictions, regulatory authorities and resource managers. CCWG aims are to ensure that the wetland resource management is included as a goal when agencies begin to define infrastructure, resources and properties that are vulnerable to sea level rise and ensure that aquatic resource protection is accounted for as adaptation planning is carried out. This project will achieve three key objectives intended to further City of Santa Cruz planning for the likely impacts associated with sea-level rise (SLR): 1) Identify what critical coastal infrastructure (municipal, residential and commercial) will be vulnerable to SLR and estimate when those risks may occur; 2) Identify specific hazards (coastal flooding, sea level rise, erosion) that pose risks to various infrastructure, 3) Define appropriate strategies for these risks and work with City department staff to identify actions that can be integrated into the updated Hazard Mitigation Plan and Climate Adaptation Plan. The project will compile an inventory of coastal armoring and water control structures to aid the prioritization (by city staff) of adaptation and protection upgrades for vulnerable infrastructure. The project team will provide the City GIS staff with updated hazard layers and provide technical instruction on the proper use these data for future City analysis and reporting. 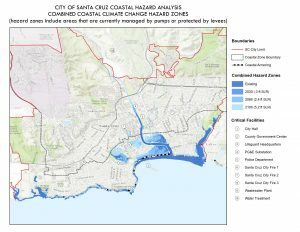 The project will evaluate adaptation response alternatives for Santa Cruz ranging from “grey to green” for use in municipal planning documents. The project will support staff discussions regarding how to implement appropriate adaptation strategies through Local Coastal Program and other planning documents. The project team will present findings to department heads and/or City Council. 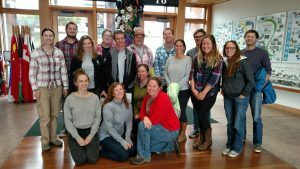 The goal of this project is to provide Santa Cruz and Monterey Counties with improved information regarding the threats from climate change to various coastal resources and land uses that best protect the multiple interests of the Counties and Cities; including municipal service districts, private land owners, the public’s access to the coast, and the protection of coastal ecosystems. This project will achieve three key objectives intended to further regional planning for the inevitable impacts associated with Sea Level Rise and the confounding effects of SLR on fluvial processes of two river systems. Identify what critical coastal infrastructure will be compromised due to SLR and estimate when those risks may occur. Identify how fluvial processes will increase flooding risk to coastal communities in the face of rising seas. Define appropriate response strategies for these risks and discuss with regional partners the programmatic and policy options that can be adopted to address these risks to the region. In collaboration with The Nature Conservancy (TNC), CCWG will act as the Geographic Lead Coordinator for the Coastal Resilience Network in Monterey. 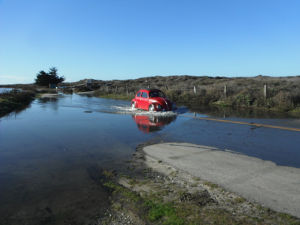 As a key participant in ongoing Sea Level Rise Adaptation Planning efforts around Monterey Bay, CCWG will act as liaison for the project, connecting TNC staff to the ongoing Monterey project’s stakeholders. CCWG will assist TNC in designing, coordinating, and hosting workshops, webinars and meetings, as appropriate, with the appropriate stakeholders in Monterey. These workshops will allow the stakeholders to react to and identify lessons learned from Monterey’s ongoing adaptation effort. By design, IRWM planning efforts are collaborative and include many entities dealing with water management. These aspects make IRWM a good platform for addressing broad-based concerns like climate change, where multiple facets of water management are affected. The intent of the Climate Change standard in the Proposition 84/1E IRWM Program Guidelines is to ensure that IRWM Plans describe, consider, and address the effects of climate change on their regions and disclose, consider, and reduce when possible greenhouse gas (GHG) emissions when developing and implementing projects. CCWG took the lead in writing the Climate Change Chapter for the Greater Monterey County IRWM Plan. The chapter describes global climate change and its anticipated impacts for the Greater Monterey County region, including an initial vulnerability analysis and risk assessment, and offers preliminary adaptation measures and climate change mitigation and GHG reduction strategies for the planning region. These strategies will be refined as more climate change data, and more refined analysis tools, become available. 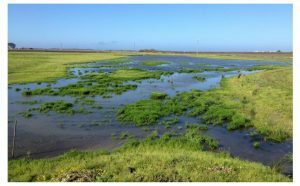 2017 Update: CCWG is tasked with updating the Climate Change Chapter within the Greater Monterey County Integrated Regional Water Management (IRWM) Plan – an existing IRWM Plan – to comply with the IRWM 2016 Plan Standards. The end result of the work will be an adopted IRWM Plan that meets the IRWM Plan Standards as detailed in Volume 2, Section II of the 2016 IRWM Guidelines. 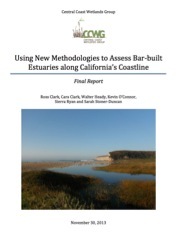 CCWG collaborated with Stanford, Center for Ocean Solutions, ESA PWA and the County of Santa Cruz to study the role of natural infrastructure in climate adaptation planning. An interdisciplinary team of scientists, economists, engineers, and law and policy experts and planners used an iterative engagement process to (1) identify natural infrastructure that is geographically relevant to local jurisdictional planning units, (2) refine data and models to reflect regional processes, and (3) develop metrics likely to resonate within the local decision contexts. 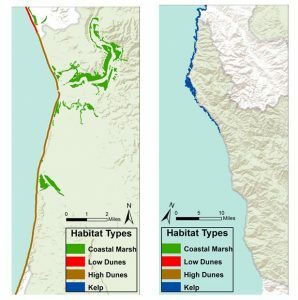 Using an open source decision- support tool (InVEST), the group demonstrated that protecting existing natural infrastructure, including coastal dunes and wetlands, could reduce the vulnerability of water resource-related structures, coastal populations, and farmland most exposed to coastal flooding and erosion. This information formed part of the rationale for priority climate adaptation projects the county governments are now pursuing.